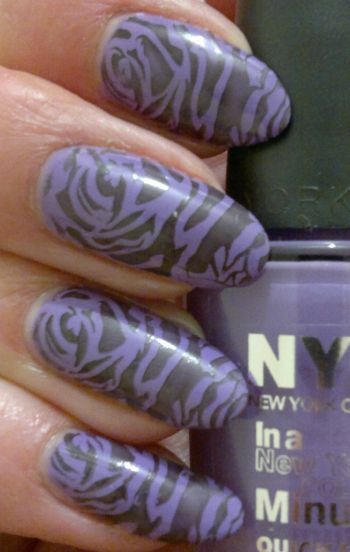 For this mani I painted my nails with NYC In A Minute 900 Wonder Purple. This kind of light purple is my favourite nail colour, and this particular polish is very nice. It doesn’t dry in a minute, but it dries reasonably quickly. Great stuff, NYC! The stamping plate I used is Pueen‘s 93 plate which is part of Pueen‘s gorgeous Buffet Leisure stamping plate collection. The black polish I stamped with is the wonderful Revlon Colorstay 270 Stiletto. I’ve already gone through one bottle, and I think I’m already halfway through bottle number 2! 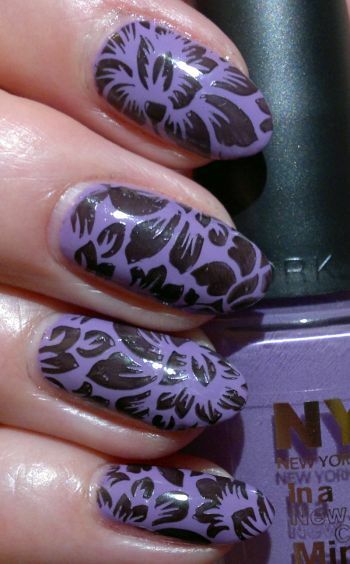 For this mani I painted my nails with NYC In A Minute 900 Wonder Purple (2 coats). Whilst the name of the polish implies that it’s a quick-dry polish, it’s not. However, the sensationally beautiful shade of purple makes up for the longer drying time. Let’s start! 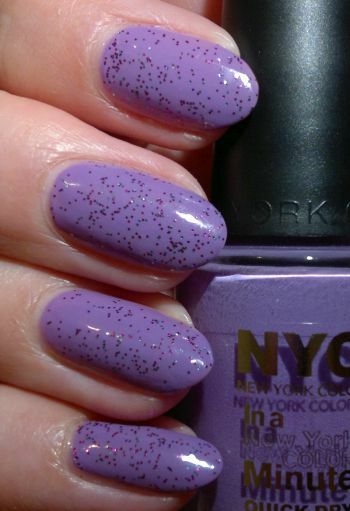 I painted my nails with NYC In A Minute 900 Wonder Purple (2 coats). This gorgeous polish cost me 33p only – it came in a trio pack for £1 (yes, three polishes = £1 in total at Poundworld). Now that’s what I call a bargain! Pueen’s 80 plate isn’t my favourite stamping plate. It’s nice to look at, but the images aren’t as nice when they’re stamped on. I don’t know why. I think I should give it another try – and maybe use different colours (something rosey…) and see how that goes. Oh, before I forget… this time I used another NYC polish to stamp on the images. Normally I use Revlon Colorstay Stiletto, but I misplaced it (so much for bringing my beauty stash in order…). So today I used NYC In A Minute 001 Evil. It’s not the best black polish for stamping, but it’s OK.